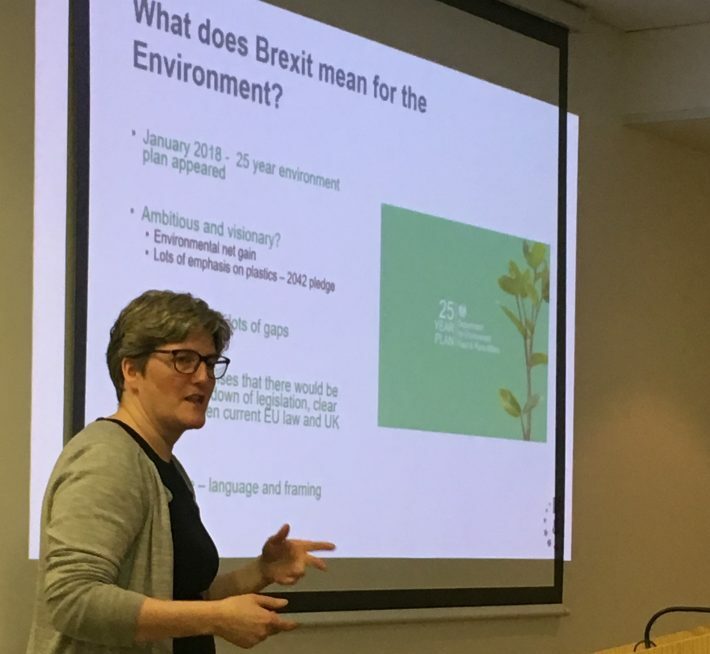 A condensed version of the talks and discussions held at the BES Conservation Special Interest Group (SIG) event on 20th February 2019, which tackled key questions for ecologists arising from the Brexit process. It’s hardly surprising that a BES event on Brexit was a sell-out. 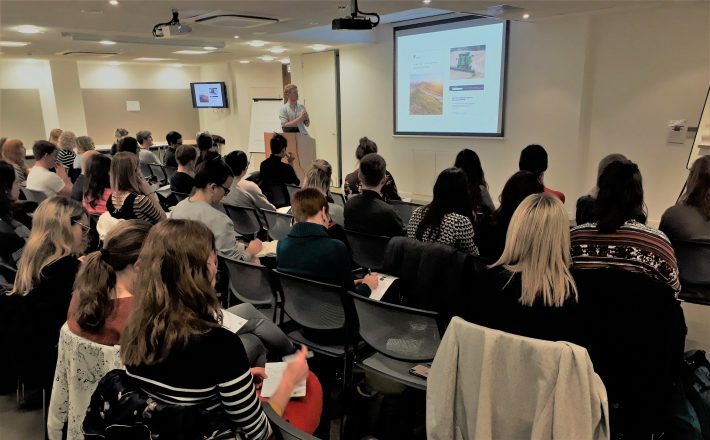 With the big day just over a month away, 50 early-career ecologists convened in London to find out what it would mean for future funding, collaborations, careers and environmental policy. Answering these big questions is not easy, and it was quite an ask to expect answers in just one day. But the event managed to deliver more answers than you might expect. The three plenary speakers were Dame Georgina Mace (UCL), Professor Charlotte Burns (University of Sheffield), and Brendan Costelloe (Policy Manager at the BES). What follows here is an attempt at extracting as much of the information imparted on the day as possible, both through the plenary talks and the discussions held afterwards, capturing both personal reflections and what you might call the ‘mood of the room’ on the day. Has membership of the EU been good for the environment in Britain? On joining the EU in 1973, the UK was dubbed the ‘Dirty Man of Europe’ since its environmental policies essentially amounted to ‘dilute and disperse’, explained Professor Charlotte Burns. But the reputational damage this caused, coupled with an increasing awareness that key policy directions being set by the EU were to our advantage, meant that the UK began to change tack. Through the 1980s, the architecture, style and content of UK environmental policy became extensively ‘Europeanised’. As the UK cleaned up its act, policy outcomes began to improve – most notably on water quality and air pollution – and our international reputation on the environment slowly recovered. But membership of the EU has also brought its share of environmental problems, as Brendan Costelloe outlined in his whistle-stop tour of EU and UK environmental policy. Most notable are those caused by the Common Agricultural Policy (CAP), which currently represents a sizeable 42% of the EU budget. When introduced in 1962, the CAP was designed to encourage intensification of agriculture, which helped to feed the continent. But the policy has since been identified as a major driver of biodiversity loss in almost all EU countries. Despite calls for reform, the CAP is still largely orientated towards direct agricultural subsidies rather than wildlife-friendly agri-environment schemes. Post-Brexit, the CAP is set to be replaced with a ‘public goods’ system in the UK. We don’t know yet what this will look like (see below for our ideas on this), but as ecologists we should argue the case for robust evidence and comprehensive monitoring to support its implementation. Although there are two sides to this (and every) coin, on the whole, the consensus in the room was that the net impact of the UK’s EU membership on the environment has been a positive one. But a massive unknown still remains: can, should and will we have to align with EU environmental policy post-Brexit? If we don’t, we must view this as a huge opportunity to transform the environmentally damaging aspects of EU environmental policies. How would a public goods system of land subsidy work? Following on from the above, if the CAP is replaced with a system of land subsidy that rewards public goods, how would this work? The idea behind this is that farmers would no longer receive subsidies to keep them in business, rather any monetary goods they produce from their land, such as meat or milk, would enter into the free market, just like any other monetary goods. Any public services that they provide through their land-use practices, such as flood protection or biodiversity, would be valued and receive payment from the UK government. This is what is being proposed by the Government in its 25 Year Environment Plan, set to come into force once the UK leaves the EU. The most obvious benefit of a move to a public goods system would be the removal of monetary support, in terms of subsidies, for practices that wouldn’t otherwise be economically viable, and are at times environmentally damaging. It’s promising that the UK Government’s 25 Year Environment Plan accepts the premise that ecologically sympathetic land management can provide benefits to society which can’t be fully valued in a conventional monetary sense. These benefits include things like water purification, soil production, flood protection and carbon sequestration. The hope is that these sorts of ecosystem services would get better protection than they do under the current EU funding regime. The difficulty with the public goods idea lies with the choice of goods deemed worthy of receiving payment. Things like flood protection and carbon sequestration are likely to be quite high up the priority list, given current political discourse. However, biodiversity and its aesthetic, recreational and wellbeing benefits are unlikely to receive such a focus. If these services don’t get included in the list, we could lose any progress made in wildlife-friendly farming under EU agri-environment schemes. Another potential snag arises over if and how payments are to be made site-specific. It wouldn’t be fair to pay one farmer less than another for, say, their contribution to carbon sequestration, simply because of the carbon value of their piece of land, especially if both are implementing the same land management practice. Most ecosystem services are influenced by factors such as soil type, rainfall and altitude, which lie beyond a farmer’s control, even when the management strategy employed is the same. This topic was discussed at length in the breakout sessions, but it’s difficult to see a simple way around this problem given that even the potential for improvement in public-good delivery could also be driven by these extrinsic factors. What will Brexit mean for the UK’s access to EU cooperation on science? Perhaps the best illustration of the EU’s contribution to science in financial terms is the size of the budgets for the Horizon 2020 and Horizon Europe research and innovation framework programmes. These are pots of money set aside for funding research over seven-year periods. Horizon 2020 (2014-2020) has a budget of €77 billion, of which the UK has secured 14.3% – substantially more than we contribute, and Horizon Europe (2021-2027) has been allocated €98 billion; in research funding terms, we are a net beneficiary, argued Dame Georgina Mace. However, after Brexit, the UK could end up having no say in shaping how this money gets spent. As UK-based scientists, we should be making the case for the maximum possible participation in these programmes once we leave. Just as importantly, membership of the EU facilitates access to networks of scientists and opportunities for international collaboration, which is how science progresses. Losing access to these networks risks the future of many projects. Not to mention the fact that half of all postgraduate students in the UK come from overseas. We need to ensure we continue to attract the best scientists and present a desirable place to come and study, work and contribute to research. What are the positives arising from Brexit? We must take full advantage of the positives arising from Brexit, where they occur. The Brexit process represents a sizeable opportunity to make improvements to environmental policy, since the only certainty is a substantial overhaul of what is currently in place. Ecologists need to have their voices heard in this process. Better still, we need to be shaping it. Brexit presents us with an opportunity to solve the problems caused by the CAP and to shape a public goods system that minimises its potential issues and maximises its positives. A well-designed system could reshape not only land-use practices across the UK, but also the public’s perception and understanding of the huge range of benefits we can and should be enjoying from land managed with an ecologically sympathetic approach. The need to hear ecological evidence and to implement robust monitoring processes has never been higher. The good news is, this will generate plenty of opportunities for ecologists to work in policy. As the department predicted to be the second-most affected by Brexit, Defra has already seen a huge increase in workload, but there are currently only about a third of the number of staff who were there in 2006; a recruitment drive is already underway. For engaged ecologists, this growing government department ready to act on the latest scientific evidence represents a once-in-a-generation chance to transform environmental policy. We must ensure we make the most of this to advocate for and achieve real improvement. What can we, as ecologists, do better? An event like Brexit illustrates the importance of integrating social, economic issues with science. There are huge opportunities here for gains and plenty to lose – the perfect demonstration of the importance of scientists remaining aware of and engaged with the political situation. This is especially true in areas connected explicitly with other sectors of society, such as the link between environmental science and agriculture. But this should also remain true in any area of science because blue-sky research is equally important for, and interesting to, the public. If ecologists are uninvolved in the Brexit process, then these huge calls on environmental policy will be made by others. But if we involve ourselves too much, we risk losing our independence and status as trusted advisers to decision makers. We need to work hard to get this age-old balancing act of integrating science with policy right. In a similar vein, a big question raised for me during the workshop was how to convince outsiders of the importance of ecological research. Scientists working in other disciplines have an easier job here, such as those in engineering, technology or medicine, because the outcomes of their research fit nicely into an industrial strategy or can easily be assigned a monetary value. As ecologists, we don’t have it so easy, but we will need to grasp this nettle and get the public properly engaged in what we do if our research is not to suffer after Brexit. And if it isn’t us that bangs the drum for ecology now, then who will, and when?